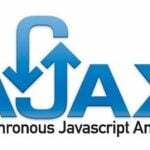 Magento Ajax add to cart extension makes the entire process more comfortable for your customers while shopping. Such an advantage can make your store more attractive increasing sales and profits. The extension is quite simple to install and configure. 1 How does Easy Cart work? 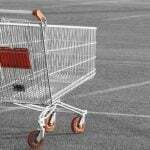 How does Easy Cart work? 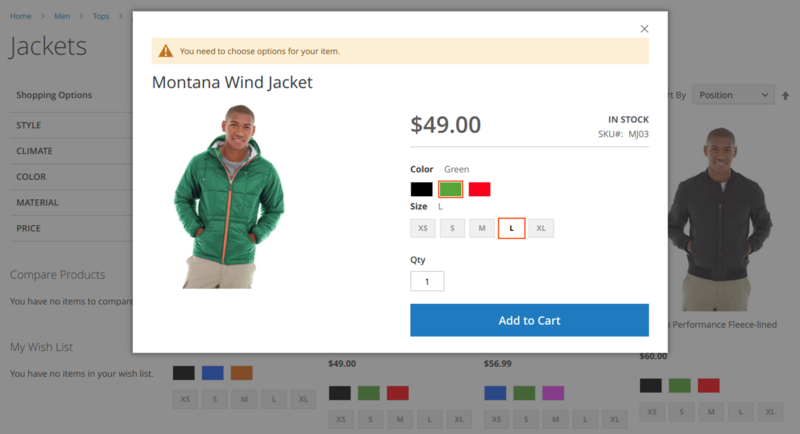 By making use of Easy Cart customers can control their carts from different product pages. It also makes it possible for customers to take advantage of different up-sells and cross-sells. An unobtrusive offer is made during the purchase after the customer added the product to the basket. The admin can alter all the recommended products in the admin panel based on timely and relevant advertising. So users can get their preferred goods quickly. That increases the sales and profits of the store. Module increases the profit based on the average customer’s order value. It is made possible by either using the number of goods or by their value – the fewer the transitions applied by the user when shopping, the more products he inspects. In the result, it increases the probability of buying more products. 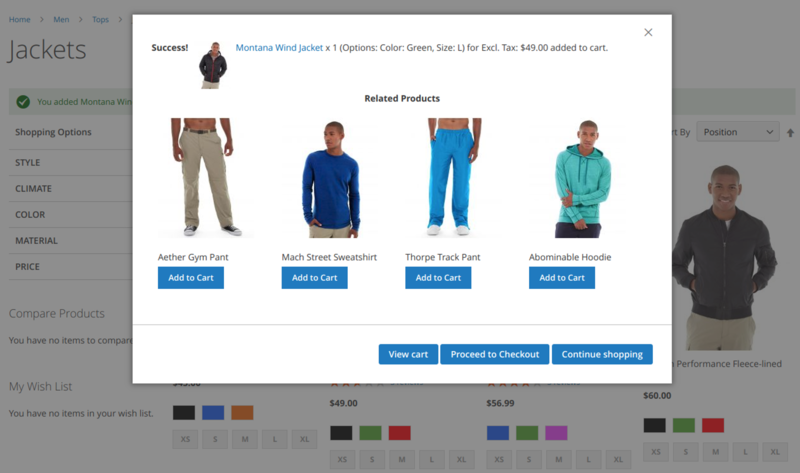 The Magento Ajax add to cart extension is quite simple to use and configure. To make use of the plugin, the admin should enable it by selecting “Yes” in the appropriate list box. In the block confirmation popup settings, the admin can alter all the general fields. 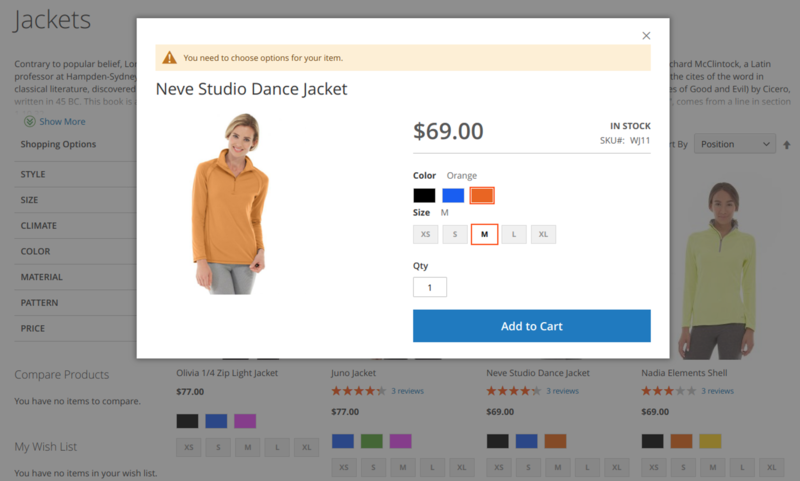 In fields such as “continue shopping button,” “go to checkout button” and “go to cart button” the admin should enable and disable all corresponding buttons affecting products displayed to buyers. 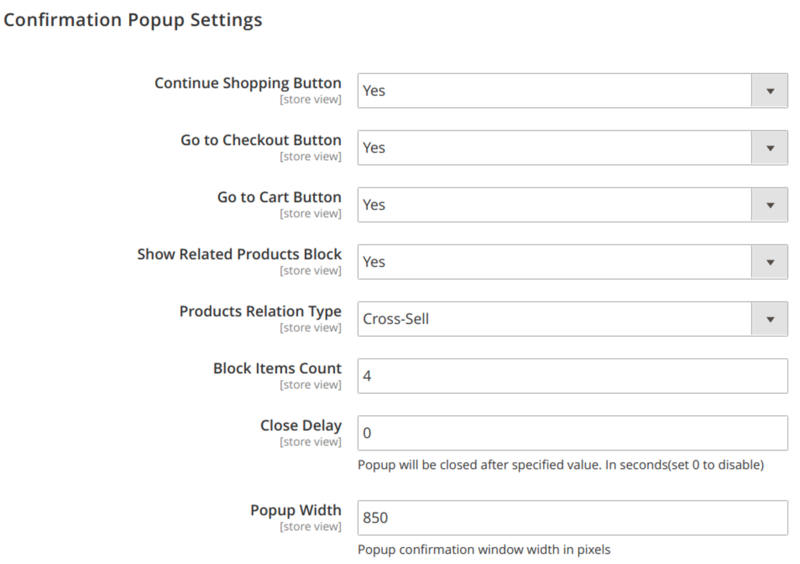 Also, in the “show related products block” field, the admin should enable or disable the ability to display block with cross-sells in the popup. In the “products relation type” the admin should make a selection of the type of products displayed to the client after adding products to the cart. They can be related, up-sell or cross-sell goods or services. However, in customising any of these types of offers properly, you need to navigate to Catalog ->Product->choose a good product->set up the items in the best fields for their proposal to the designated buyer of such products. In “block items count,” admin can input the required cross-sell items count. In the “close delay” field, admin determines the value in seconds after the popup has closed. You can disable this option by typing “0” in this area. The “Popup width” field was created to make it possible to specify the width of the popup window in pixels. The second part of the configuration, “Add Product Confirmation” makes it easier to alter the success message of the popup. The last part of the configuration, “Remove Product Confirmation” was created to alter the text of the remove message confirmation popup. 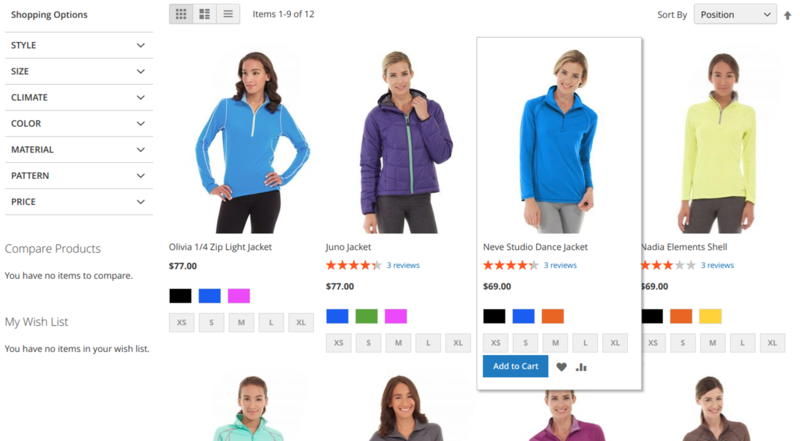 The button “Add to Cart” is displayed when the cursor hovers over a preferred product. After clicking on the button, in the new window, you can pick all the necessary parameters including colour, size, and quantity. Upon selection of the preferred settings, you should click on the “Add to Cart” button once more. After these manipulations, the system shows a popup of a success message. Based on choice, you can customise the cross-sells and up-sells. You can find them along with the Success Message without the page having to refresh. A typical day got from Lorel’s shopping diary. A popup window appears. 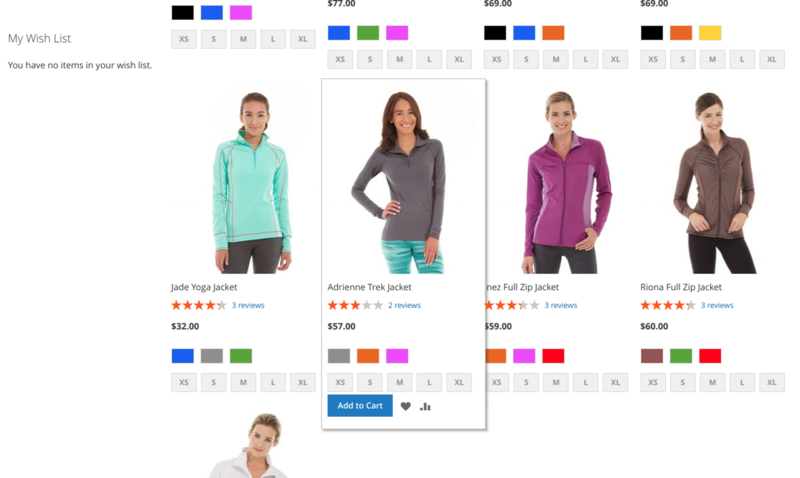 The default picture of the product shows me a blue variant of the jacket. I am interested in the orange one, so I click the orange button. Now I get access to the orange option, but I decided to check for more variants. 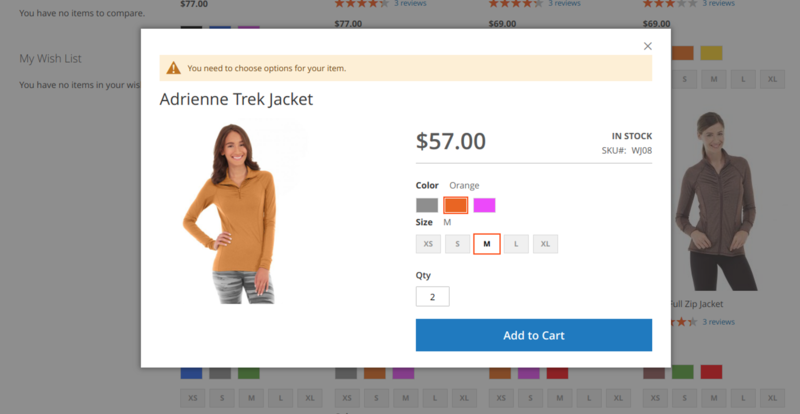 A success message displays that the Adrienne Trek Jacket x 2 (Options: Color: Orange, Size: M) for $57.00 now located in my cart. A new popup now displays three further steps. 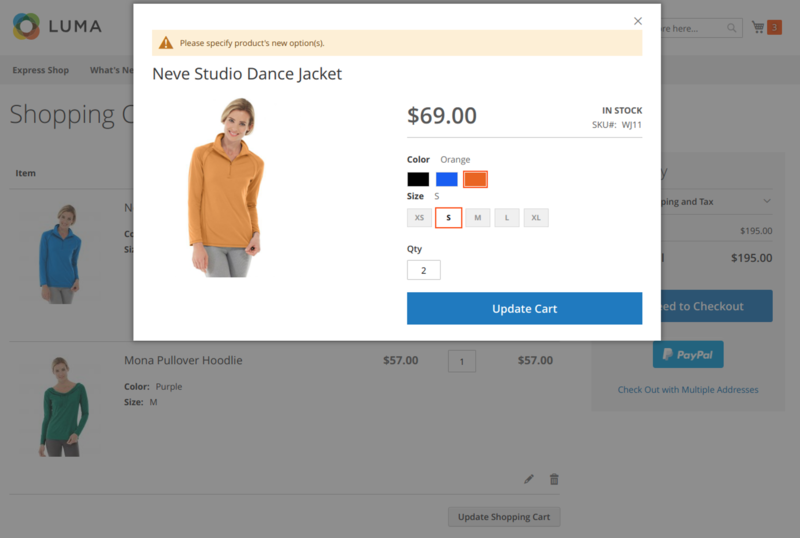 These steps are “View Cart,” “Proceed to Checkout” and “Continue shopping” and as always, related products (there was Tights, Pullover, Capri and another Hoodie). Then I noticed pullover and remembered that some time ago wanted one and added it into my shopping cart. So, I clicked the button “Add to Cart” under the Mona Pullover Hoodie, picked the purple colour, size M and one item. Then I clicked the button “Add to Cart” again. 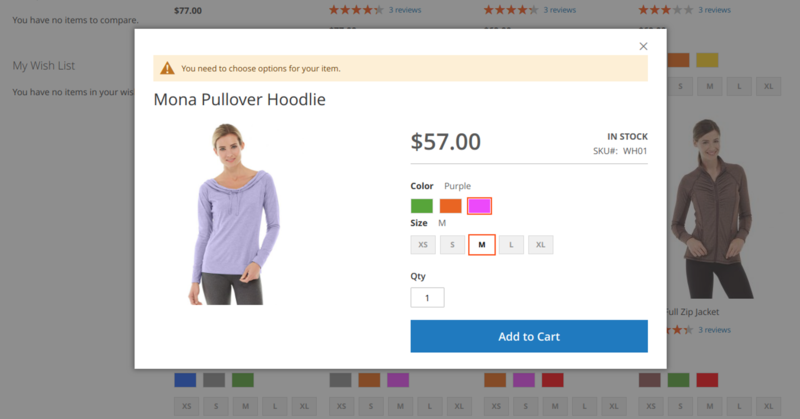 Another popup of a success message and related products to the pullover comes up. Before deciding to checkout, I decided to check out the goods I had chosen. After clicking on “View and Edit Cart,” the webpage redirected me to the shopping cart. Here, I can delete a product or update an item quickly, without having to do too many clicks, so I decided to set S size for my pullover. After having a quick shopping and when filled my cart with items, I pressed to proceed to checkout. 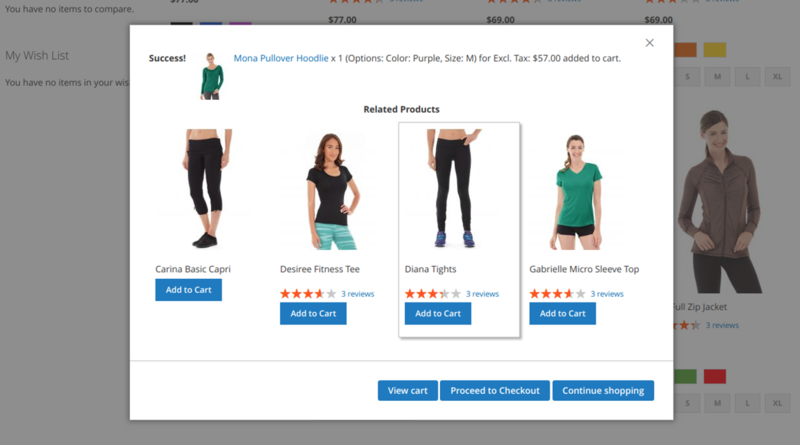 The Magento Ajax add to cart extension makes the buying process easier in comparison with the original Magento 2 functionality. Reducing the need to navigate to different pages is very useful when compared with the continuous blockage of traffic when searching for the right product. Our Easy Cart makes it easier for the buyer to have full control of shopping. At different times, on different pages, the buyer can gain access to the shopping cart and make slight changes to the preferred products. 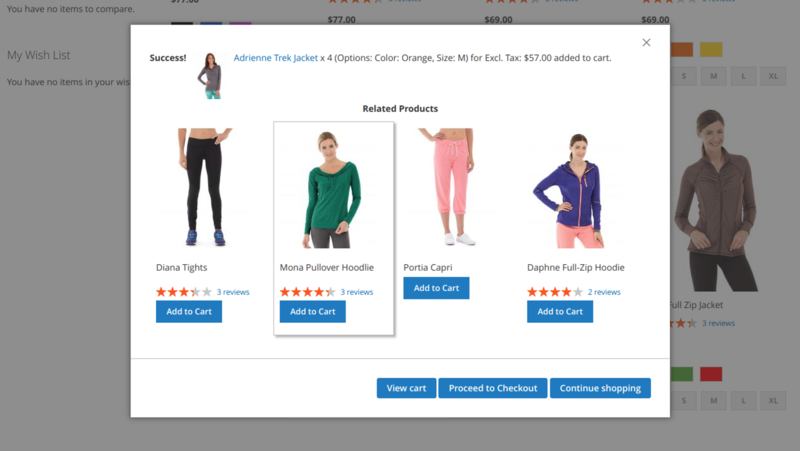 The extension can delete existing products and replace them without having to navigate to different pages. Access to free support from our team of specialists. A 100% warranty in case you change your mind for any reason within 15 days for different extensions. You can always visit our webpage to get access to a better offer. At all times we are ready to answer questions and provide support.